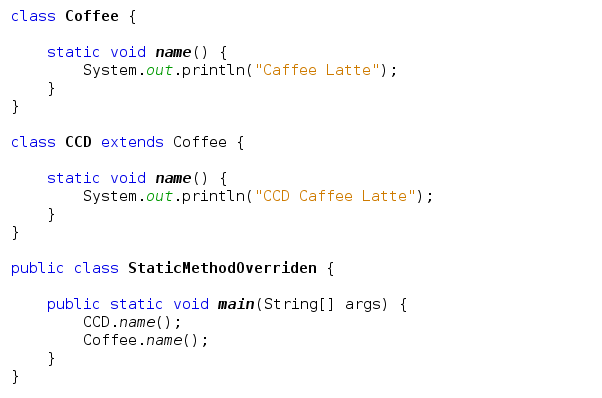 In this post, we'll see the use of static keyword in various locations including what can be marked static or not in Java and how static creation differ from normal object creation. The static modifier is used to create variables and methods that will exist independently of any instances created for the class. All static members exist before you ever make a new instance of a class, and there will be only one copy of a static member regardless of the number of instances of that class. In other words, all instances of a given class share the same value for any given static variable. A class nested within another class, but not within a method. Imagine you've got a utility class with a method that always runs the same way; its sole function is to return, say, a random number. It wouldn't matter which instance of the class performed the method—it would always behave exactly the same way. In other words, the method's behavior has no dependency on the state (instance variable values) of an object. So why, then, do you need an object when the method will never be instance-specific? Why not just ask the class itself to run the method? Suppose you want to keep a running count of all instances instantiated from a particular class. Where do you actually keep that variable? It won't work to keep it as an instance variable within the class whose instances you're tracking, because the count will just be initialized back to a default value with each new instance. Static variables belong to a class. They are common to all instances of a class and aren’t unique to any instance of a class. static attributes exist independently of any instances of a class and may be accessed even when no instances of the class have been created. You can compare a static variable with a shared variable. A static variable is shared by all of the objects of a class. Variables and methods marked static belong to the class, rather than to any particular instance. In fact, you can use a static method or variable without having any instances of that class at all. You need only have the class available to be able to invoke a static method or access a static variable. static variables, too, can be accessed without having an instance of a class. But if there are instances, a static variable of a class will be shared by all instances of that class; there is only one copy. A static method can't access a nonstatic (instance) variable, because there is no instance! Think static = class, nonstatic = instance. Making the method called by the JVM (main()) a static method means the JVM doesn't have to create an instance of your class just to start running code. One of the mistakes most often made by new Java programmers is attempting to access an instance variable (which means nonstatic variable) from the static main() method. 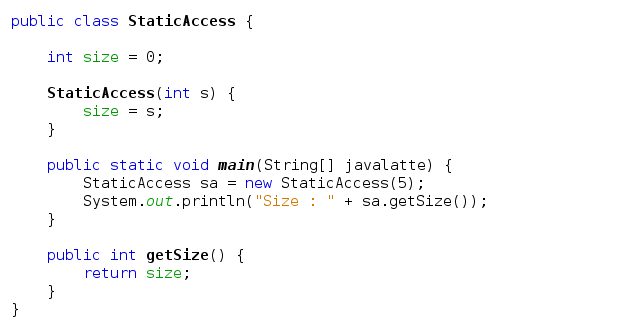 In this code, we instantiated a StaticAccess and assign it to the reference varialble sa and then use that sa to invoke method on the StaticAccess instance. In other words, the getSize() method is invoked on a specific StaticAccess object on the heap. But this approach (using a reference to an object) isn't appropriate for accessing a static method, because there might not be any instances of the class at all. That's the reason main method is always static. The Java language also allows you to use an object reference variable to access a static member but later this is discouraged. This is merely a syntax trick to let you use an object reference variable (but not the object it refers to) to get to a static method or variable, but the static member is still unaware of the particular instance used to invoke the static member. In the StaticVariableAccess example, the compiler knows that the reference variable sva is of type StaticVariableAccess, and so the StaticVariableAccess class static method is run with no awareness or concern for the StaticVariableAccess instance at the other end of the sva reference. In other words, the compiler cares only that reference variable sva is declared as type StaticVariableAccess. Finally, remember that static methods can't be overridden! This doesn't mean they can't be redefined in a subclass, but redefining and overriding aren't the same thing. The version of the overridden instance method that gets invoked is the one in the subclass. The version of the hidden static method that gets invoked depends on whether it is invoked from the superclass or the subclass. 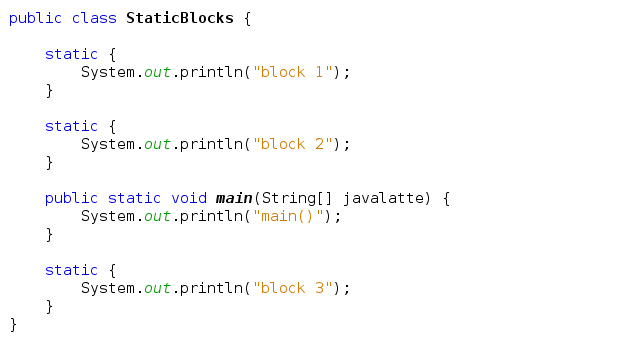 A class can have any number of static initialization blocks, and they can appear anywhere in the class body. The runtime system guarantees that static initialization blocks are called in the order that they appear in the source code. 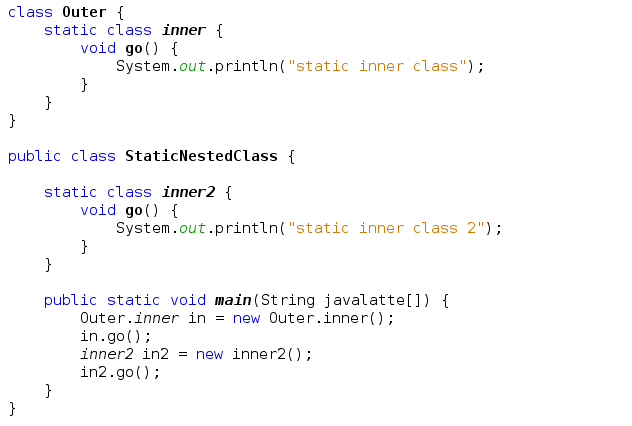 A static initialization block runs once, when the class is first loaded it's means after a considerable amount of time after the class is loaded as Java make a distinction between class loading and class initialization. ( thanks of Lew Bloch for making it more clear) It.An instance initialization block runs once every time a new instance is created. Static nested classes referred to as static inner classes but they really aren't inner classes at all, by the standard definition of an inner class. While an inner class enjoys that special relationship with the outer class (or rather the instances of the two classes share a relationship), a static nested class does not. It is simply a non-inner (also called "top-level") class scoped within another. So with static classes it's really more about name-space resolution than about an implicit relationship between the two classes. The class itself isn't really "static"; there's no such thing as a static class. The static modifier in this case says that the nested class is a static member of the outer class. That means it can be accessed, as with other static members, without having an instance of the outer class. Your article provides step by step guidance about the use of the static keyword. the static keyword is a very important topic in java. we should know how and where to use it. what is the purpose to use the static keyword at different places? the static keyword is used in Java especially for memory management. we can use the static keyword with variables, methods, nested class, blocks.Static variables share the common memory area allocated at the time of class loading. we don't have a need for an object to invoke static methods. static blocks are used to initialize the static data members. static block is executed before the main method. I also visited a blog which provides a complete tutorial on How To Learn Java Programming easy and quick. Excellent post!!! In this competitive market, customer relationship management plays a significant role in determining a business success. That too, cloud based CRM product offer more flexibility to business owners to main strong relationship with the consumers. CIIT is the biggest ERP SAP training institute in Noida with high tech infrastructure and lab facilities and the options of opting for multiple courses at Noida Location. CIIT in Noida prepares thousands of aspirants for ERP SAP at reasonable fees that is customized keeping in mind training and course content requirement of each attendee. CIIT Noida is one of the best ERP SAP training institute in Noida with 100% placement support. CIIT has well defined course modules and training sessions for students. At CIIT ERP SAP training is conducted during day time classes, weekend classes, evening batch classes and fast track training classes. Thanks for taking time to share this valuable information admin. Really informative, keep sharing more like this. Java plays a major role in today's world. Your blog gives a lot of information. Keep sharing more like this. The provided information’s are very helpful to me. I am very glad to read your wonderful blog. Got to learn and know more in this. Thank you! Such a wonderful think. Your blog is very nice. Thanks for a marvelous posting!!! Wonderful blog!!! Thanks for your information… Waiting for your upcoming data. Your blog is very interesting. I like more updates from your blog. Thank you for your worthy post. Well done! This is really powerful post and also very interesting. Thanks for your sharing and I want more updates from your blog. Your writing is very unique. Amazing post. It is very informative. Thanks for sharing.